Many, many, many months ago I registered for Grandma’s Marathon. It is an iconic race that has been on my “must run” list. I was thrilled when I was able to get into the event and find a hotel room for the very crazy weekend. This is one of the few marathons that I did not do my homework for. I usually research the town, history, and course of a race before I register…not Grandma’s! I had heard stories about this event from seasoned runners I deeply respect and wanted to experience it for myself. Early in the year we received a training jacket as part of our registration fee, which was a nice touch. I cannot say that I have ever had a race ship out a training item with zero strings attached. Most events do offer training gear that you can purchase independent of the race fees. It was a nice heavy jacket and I cannot wait wear it now that I have finished the race (I’m weirdly superstitious and don’t wear race gear until I’ve conquered an event). Before I knew it race weekend was upon us. I love traveling to races, but HATE packing for events. The 6 hour drive to Duluth, MN was beautiful and went surprisingly fast. Since we got a late start we headed straight to the packet pick up for area at the convention center. Upon arrival we had to pay to park at the center, which was a new thing for me, most locations wrap this into the price of your registration. It wasn’t a huge deal, but just strangely new. The convention center was huge. We missed all the hoopla of the expo with the vendors, speakers, and dinner. I love expos and look forward to hearing speakers, if I run this event in the future I will try to get up to Duluth earlier to take all these things in. The upside to arriving late to the expo was the quick pick up of my packet. We were in and out (including parking and walking) within 15 minutes which allowed us to get back to our hotel and in bed early. The marathon is a point to point event. Luckily one of the bus pick up locations to take runners to the start was at our hotel. I was able to catch a few extra minutes of sleep. The hotel also had early breakfast set up for runners. In talking to the hotel front desk I was intrigued to hear how the whole town gets involved in the race…it is a big deal to them! The support felt by the city was evident as the day continued. There was a very cool buzz of excitement that built throughout the morning. On the bus the positive feeling continued to flow as runners nervously chatted. 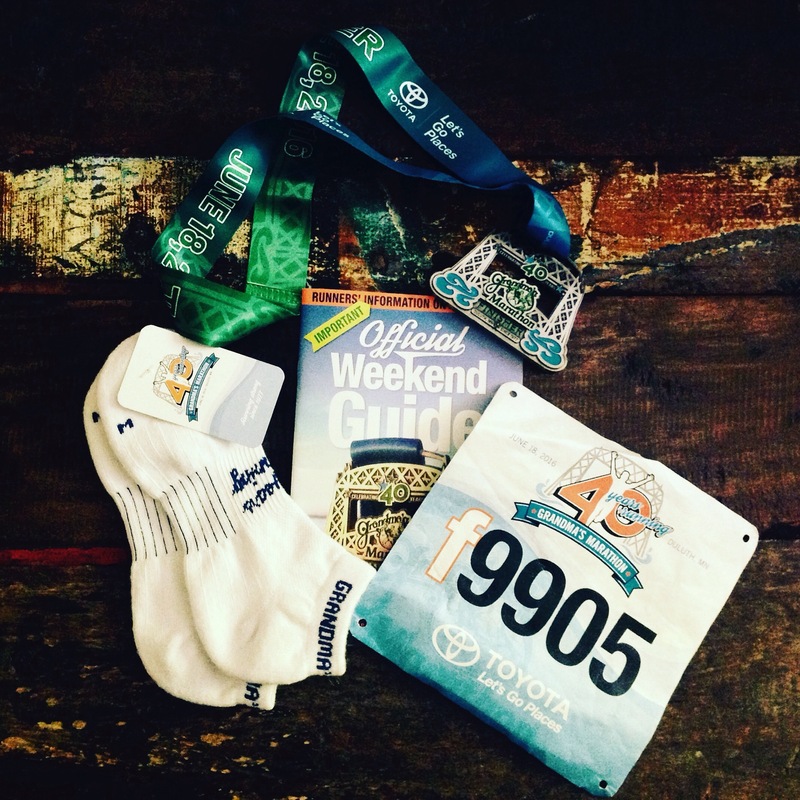 I had the pleasure of talking with a young 1st time marathoner. She was nervous about the weather. In that moment I realized that I had not checked the weather predictions like I usually do. I’m an type A runner and try to plan for all that I will need in an event. Luckily I had prepped for this event like it was a training run and brought all my gear for a solo run. Prior to the race I had connected with a high school friend who was also running. Our plan was to run together and catch up. After riding the bus for about 30 minutes we were dropped off at the starting village. This was a little nuts. There were two sections of porta-potties for runners and lines of trucks to take checked gear. We had to walk about 5 minutes to get to the village from where the buses dropped us off. As we came into the village chaos insued. Runners were everywhere! 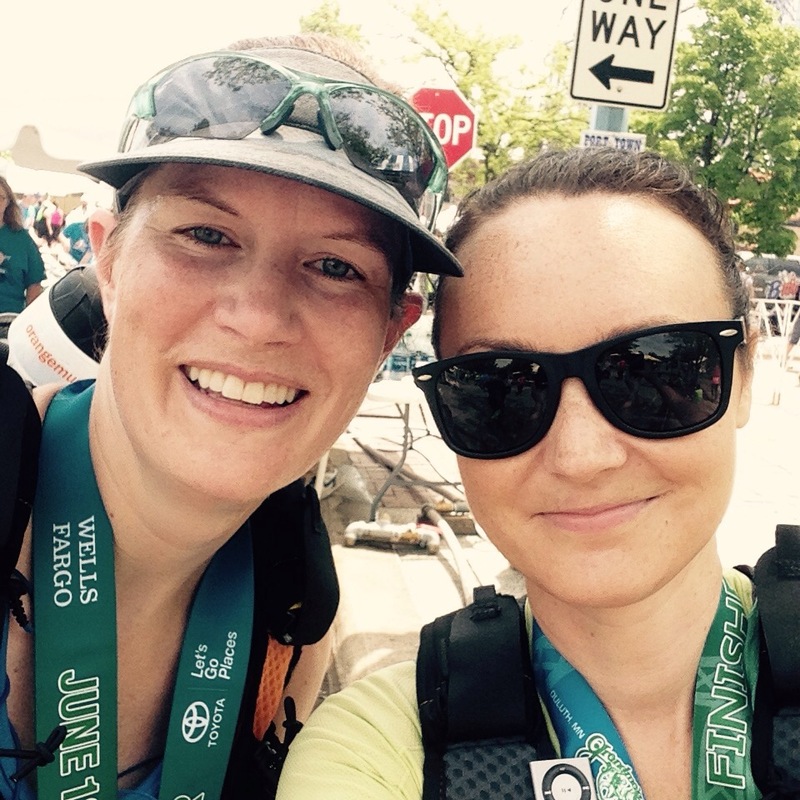 I was able to connect with my friend Elle and also meet up with fellow Oiselle birds getting ready to run. After introductions we took a few pictures then headed for a last minute pit stop to the bathrooms. Time zipped by so quickly. Elle, Brian, and myself dropped our gear and headed to the start. For an event of this size and history I was very shocked to find that there were not corals. Runners were moving slowly towards the balloons that indicated the start line. The Star Spangled Banner was played, last minute instructions were given, and we started. Our group began at a nice slow pace to ease into therace and also let the faster runners get by. I purposely did not wear my Garmin watch so that I could go off of Elle’s pace and we could have fun together. A few miles into the race we all realized that the temperature was climbing quickly. It was in the upper 70s when we started and the flags on the course were green (which is good). Around mile 7 I was sweating heavily and could feel myself heating up. The next course flag we passed was changed to black…not good. We all made a conscious effort to remind each other to drink and stay as cool as possible. I was beyond glad that I had chosen to wear my Orange Mud HydraQuiver VP1 bottle system with Tailwind Nutrition. I like to have my own fluids throughout hot races and have found that wearing a vest and filling at aid stations as I need more. Tailwind makes to-go sticks that allow for you to fill bottles easy while in a race. With temperatures rising and humidity spiking we all were drinking a lot. Elle was also wearing a HydraQuiver and Brian had a belt system on. You could tell that others were struggling with staying hydrated and beginning to fade early on in the race. The organization of this event was top notch! Throughout the day EMTs on bikes rode the course, cooling buses were also available, and aid stations were well stocked with water, PowerAid, ice, and sponges. To keep our spirits up we joked a lot and swapped stories. 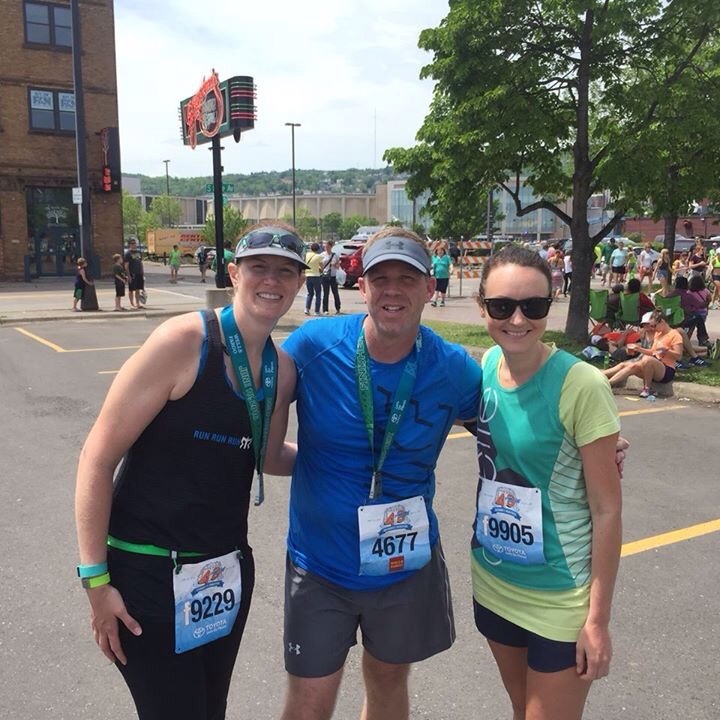 It was fun to run with these two, it made a tough day enjoyable. When I was speaking to the hotel employees they mentioned that the city gets crazy for this race, boy they were not kidding. Along the course people came out with hoses and set up make shift water stations. They were cheering and playing music as loud as possible, it was so much fun and very much needed. The shade was hit or miss and not helping to keep us cool. Without the hoses from volunteers we would have struggled. I cannot say enough about the beauty of this course. Running along Lake Superior was breathtaking. We started with the sun coming up which created the most amazing back drop. One of the things that I did not realize was that the sun would rise on my left side. When I was done and back in my hotel room that began to sink in…I was badly sun burnt on just my left side and the back of my neck. Going through the sprinklers kept me cool on the course, but it did a number on the sunscreen I had applied before the race. Note to self, pack sunscreen in my hydration vest for reapplication after a few hours. I’m not one for fanfare in a race, but I will have to admit I have grown fond of big giant balloons. The course was marked with them. It was refreshing to see them as we pushed through the later miles. To make sure that runners saw them the organizers had them attached to long strings with colorful flags. Since they were filled with helium they floated high into the air and were very visible…like a beacon of hope as we trudged forward mile after mile. For the most part the course was flat. We did encounter a few hills to start, but they were gradual and easy to keep moving up at a slow pace. Towards the end of the race we entered the city and had to navigate around several corners and take on one bridge. Coming into the finish area though the cheering crowds were amazing. The party vibe drew runners in and helped pull them through the last few miles. The finish line was recorded and footage was later emailed to each runner. 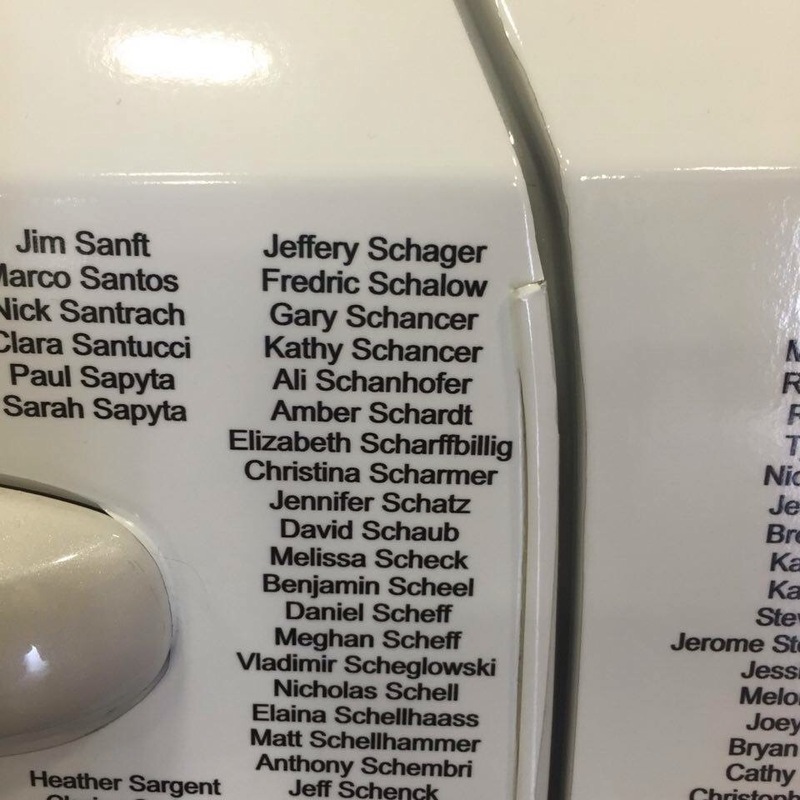 This was a really nice touch and not something I had ever seen before. We were efficiently moved through the finish line area and given our medals. Food was abundant a few feet from the finish area. Elle and I grabbed our checked gear and some food, but to be honest the temps were so high at this point we just wanted water and to sit down. We waited for Brian and also Elle’s family to meet up with us then we headed to bus area. Another nice touch was free shuttles back to the hotels from the finish area. I did have to wait about 30 minutes to get onto the buses. While waiting I got to inspect my medal and finishers shirt. The medal was really heavy and nicely made. The shirt is by far one of my favorites. The artwork on it is so unique and creative. My aunt is making me a quilt with my race shirts and this one is going to be on it for sure! Despite the weather this was a wonderful event that was made so much better with the company I had along the course. I cannot thank Elle and Brian enough for the awesome conversation while we gutted it out. Brian says he is done running marathons, but Elle promised me that she would take on another one…I cannot wait for that to happen (maybe we can guilt Brian into it too). 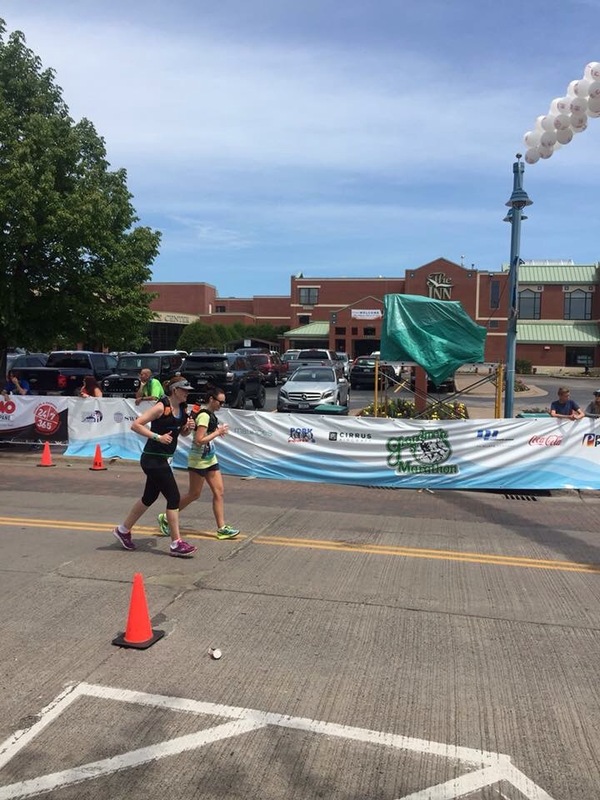 Every finish is special to me, but this was extra special as it was the 1/2 way point in my journey to run 40 marathons by 40 years old. I cannot wait to take on #21! 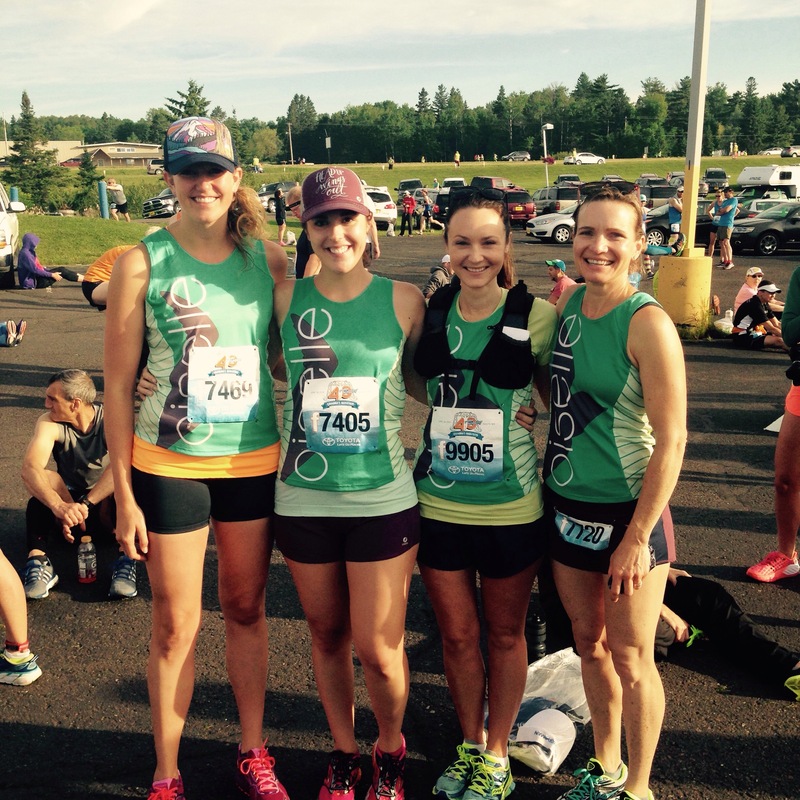 Oiselle – Lori shorts, Wazelle short sleeve shirt, and team singlet. Saucony – Zealot shoes with a 4mm drop. Sunglasses – Cheap $7 Amazon purchase that I cannot live without. Run Gum – I save my Run Gum as a reward later in a race…it is something to look forward to for a little caffeine boost. Mint is my favorite and I totally enjoyed it at mile 22. Cool and refreshing on a blistering day!!! Aquaphor – I carry a small tube with me in case I get chaffing. Around mile 15 I noticed my shorts were rubbing on the front of my thighs from excessive sweating. I applied a thin layer and was good to go for the remainder of the race. Since it is waterproof it did not come off even when running through the sprinklers or using wet sponges to cool down. Weirdly I saw you and your group in the race around mile 7. It was so great to see you and Josh doing well. It was a fun marathon! On to the next adventure. What do you have in the works?